Last night with D to the concert performance by the Sydney Symphony of Pelléas et Mélisande. Although the two tickets that I picked up just a day or so before were shown on the booking plan as the only free pair of seats in the stalls, there were quite a lot of empty seats at the start. Some of these were filled by latecomers who overlooked the 7pm start, but I got the impression there was a bit of an interval exodus to offset this. As ever, it seems that a segment of the SSO subscriber base is simply not so keen on vocal works, even though this was conducted by Charles Dutoit, and even though the orchestra plays such a prominent role. In terms of plot and incident, the opera is a bit slow – it’s symbolism rather than drama, though things get moving a bit more in about acts III and IV. The strongest impression one gets is the atmosphere of a remote place in a distant time – you really feel that a whole world is created. It’s hard to put your finger on why this is so but in away the elusiveness yet distinctinveness of the atmosphere and the music is exactly the point. I’m going again tonight and am very much looking forward to it. I went and, despite an unwelcome work-related thought which stole up on me and I found impossible to banish for an entire scene, enjoyed it very much. This afternoon I was able to hear about half on ABC “Classic” FM, where Saturday’s performance remains available to listen to again for the next 28 days. I was away in Canberra for a belated/extended Queen’s Birthday long weekend so it was only at the last minute on my return on the Wednesday after that I arranged to go and see some films at the Sydney Film Festival. The first, on Thursday night, was Call me by your name. D (who can only be persuaded to go to the cinema to see “gay” films) came with me for that. I sensed while I was watching that this might well be an adaptation of a novel, and indeed that turns out to be the case. The film is full of little details shown to us which, to me, at least, were not really explicable at the time and are only made retrospectively clear by reading up on the book. The story is set “somewhere in Northern Italy.” The context for the depicted coming-of-age is that European kind of long languid summer which we don’t really have here in Australia. (A quibble: even this European summer could not really have been as languid for the 17-year-old protagonist as depicted. Surely he needed to put in a bit of piano practice?) It is all very beautiful in a Merchant-Ivory kind of way (Ivory wrote the script). I enjoyed it, as I think did D, though he afterwards observed that he feels he is too old for this kind of movie. Ironically, my East German friends remember this response to adversity favourably as giving rise to a greater social connectedness than under capitalism – which on one view just substitutes different adversities such as lack of money for those at the bottom of the pecking order. But back to the film. At the start we see the teacher getting each child in her middle-school class to tell her what their parents do. Helping each other, in this case, turns out to mean the parents helping the teacher, in exchange for which she dispenses favouritism and tip-offs as to what to revise for class quizzes. That may seem benign. The darker side is if co-operation is not forthcoming, because the flip side of favouritism is victimisation of the children of parents who refuse to play the game. As the music makes clear from the outset, this is all played as a comedy, obviously with a bite. Zuzana Mauréry in the title role gives a bravura performance. Both films were screened at the State Theatre, which for me was part of the point of going. In these multiplex days there is something of a time warp in going there – not just for the glorious fantasy architecture, but also of being part of a really big audience with a sense of occasion. At the start when I go to the State I always have a bit of a double-take at the relatively small (to the size of the cinema and the proscenium) screen. In fact, I find I adjust to that quite quickly, and the sound system (obviously updated) rises well to the feel of the big room full of people. The afternoon session of The Teacher still had a bit of the duffle-coat-and-and-thermos atmosphere of film festivals of yore. The other more specific time warp was that both films were set in 1983. In CMBYN that presumably came from the novel. The film signalled it in various ways, starting with the Sony walkman (Sony also produced the film) which the young protagonist was wedded to as he transcribed music with pencil and paper, and including the various popular-music-themed t-shirts he sported. Obviously cars and decor also matched the period. My own memory of 1983 is that news of HIV/AIDS was beginning to trickle out. Yes, I know the first news was in 1981, but I wonder if the boy’s parents would have been quite so open to his having a gay romance even a year later, in 1984. At the very least, they would have surely felt obliged to have a little chat about precautions. Cinematographer Martin Ziaran, art director Juraj Fabry and costume designer Katarina Strbova Bielikova have come up with a warm look, with colorful, 1970s-like patterns. This initially counterintuitive choice is the opposite of the cold, austere and bleak way in which the Romanian New Wave has visualized the Communist era, for example. But it works beautifully as a counterpoint because despite the warmly nostalgic look, the film’s themes and message make it clear the era was not something we should look back on fondly in any way. That’s a US perspective. I’m not sure if things are quite so black-and-white as that (the film itself offers a little 1991 postlude). I’m probably a bit of a fraud to claim any film-festival-going credentials for having seen either of these films. Given Sony’s moniker on CMBYN and Palace Cinema’s on The Teacher my guess is that, provided you live in a metropolitan area of Australia, you can expect to see both of these films coming soon to a cinema near you. I had picked up at the last minute two restricted view seats – on opposite sides for obvious reasons. Erighetta e don Chilone was a genially amusing (if not quite side-splitting) two-hander for Taryn Fiebig and Richard Alexander. It’s a Neapolitan piece from the 1720s so stylistically think Pergolesi, who apparently studied with Vinci. I enjoyed it though the business with a book (apparently it was meant to be a play within a play and a read-through at that) didn’t really add much for me. The two Rameau works are both Actes de ballet. Dance is a big element of them. That is always a bit tricky because our modern tastes for dance and, I venture to say, the significance we attach to it, are probably not the same as in the original context. Or maybe not so different. Pigmalion, where there was actual dancing, managed this more successfully; Anacreon was a bit busy and the resort to rhythmic movement as a substitute for dancing always feels a bit lame. It’s said in such texts as I found in fragments on the web (or at least some of them) that Pigmalion is Rameau’s most successful work in this genre. On Saturday, Anacreon had the advantage with me because (as I later realised) I have repeatedly listened to a chunk of it as part of a very old Les Arts Florissant compilation set of CDs. By Tuesday, Pigmalion prevailed. I also felt that stylistically it was the more successfully realised. I’m not a critic, so no roll call and just nice remarks. Lauren Zolezzi, L’Amour in both works (first a kind of feminine Cupid in something rather like Con High uniform and then more adult and in masculine attire a la Cherubino) was probably the newcomer of the night. In the orchestra, the violins were in fine form – how standards have risen over the years in the early music biz here in Oz! Leader Matthew Greco played up a storm, especially in a very striking solo in the Vinci. I only noticed one tiny suspect moment in the oboes, which also is a sign of progress in the reliability stakes over the years though perhaps the parts in these works were not the most demanding or exposed. Both of the Rameau pieces reserved particular moments of poetry for the flutes, and these were delectable. The fast section of the Pigmalion ouverture includes what I can only describe as a particularly mind-blowing double hemiola system . I don’t find it so easy to get worked up for an afternoon performance. I’m sure that on Tuesday I was in a more receptive mood than on Saturday. But there is also much to be said for what you can get out of something the second time around, provided of course that it is something that bears repetition. On Tuesday I enjoyed the program very much. Temporary postscript: for the next 3 or so weeks the performance broadcast on Sunday night can be heard from the ABC “Classic” FM website here. Not long after, the path emerges just behind the Concordia Club near Tempe. I take a left along Carrington Road. 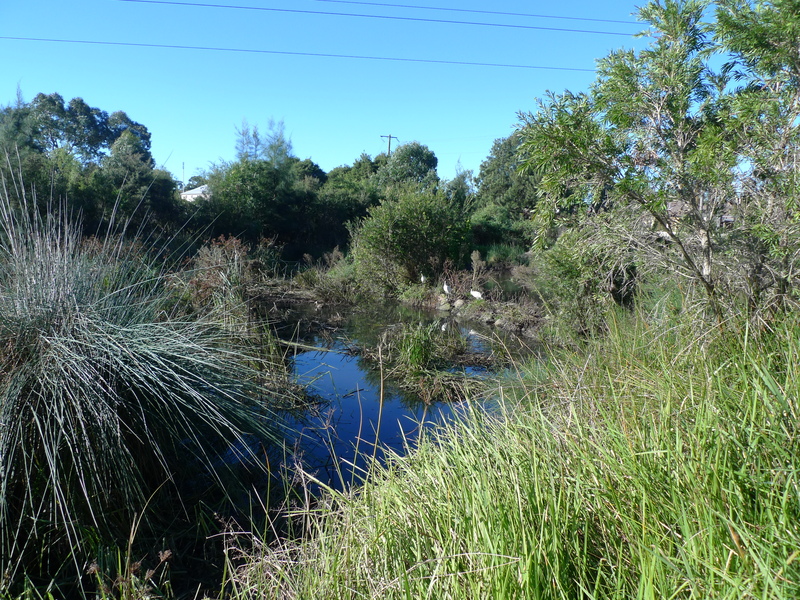 Once we spoke of remnant bushland (until Mike Baird had it bulldozed to make a parking spot for heavy equipment whilst the M5 is extended); now we might as well speak, in the inner city at least, of remnant industrial areas. The buildings pictured (or some of them) were built in 1926 as a car assembly plant for General Motors. Ibis roost in the palms and patrol the battlements. Who even knew there were still Rosicrucians? 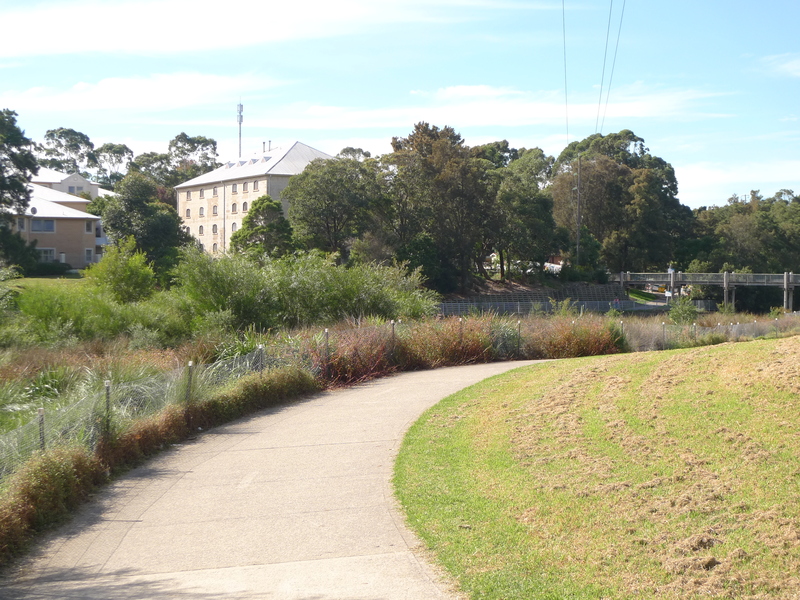 Pictured in the foreground is a separated cycle way which the now-merged Marrickville Council installed. Problematically, the cyclists are faced with a “Give Way” sign each time a side street (itself with a “Give Way” sign in favour of Carrington Road) intervenes. Further on, the cycle path dumps cyclists across the road with no warning to motorists other than an overgrown sign. I find it safer to stay on the road. The Carrington Road “precinct” has an almost-forgotten air to it. To me that is part of its “you-find-this-ugly” charm. The precinct is unlikely to remain forgotten for long. It looks as though it will soon be thrown to the wolves of “urban renewal” – ie, more apartments. There is money to be made. Urgers are already on the case. 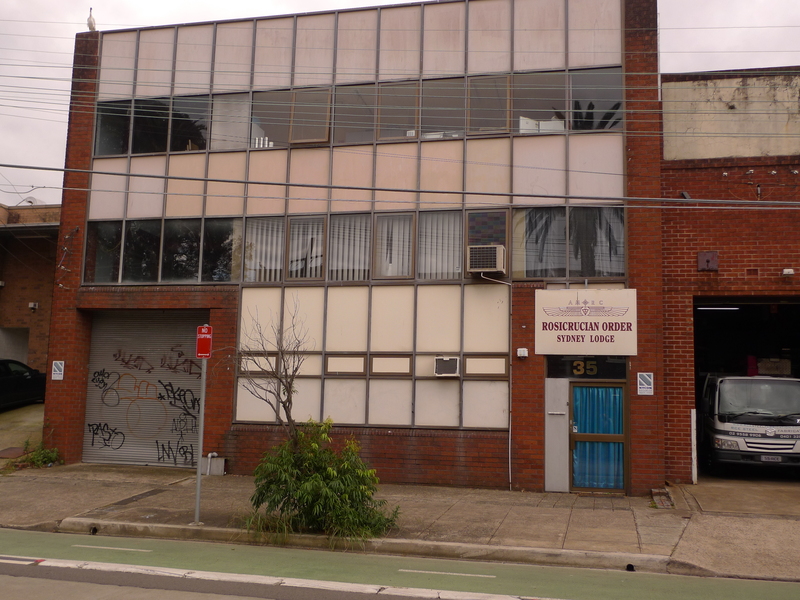 Until that happens, the precinct and the larger Marrickville-Sydenham precinct which I then ride through after ducking under the railway (past the mysterious and only really visible from the train Sydney Water pumping station where there also appears to be movement at the station) is given over to mixed light-industrial uses – distribution centres of one sort or another, motor workshops, community welfare groups and a strange preponderance of coffee roasters and wholesale bakeries emitting tantalising aromas. Build it and they will come, I previously posted about the bike racks at Sydenham Station. It is time to tether my steed. Just over a year ago, I moved to Canterbury. Ironically, just as NSW mergers of local government areas brought into being an officially designated “Inner West,” after over 30 years (leaving aside my Perth sojourn) I am no longer living there. That was a bit of a blow to my geographical self-respect (self-regard some may say). It also means that I am one big hill further away from the city. As age takes its toll, that has proved an obstacle to a bicycle commute. Maybe one day I will surmount that. Meanwhile, when time and weather permit, I can ride to Sydenham and take a fast and more frequent train from there. This is my new scenic ride (half way) to work. 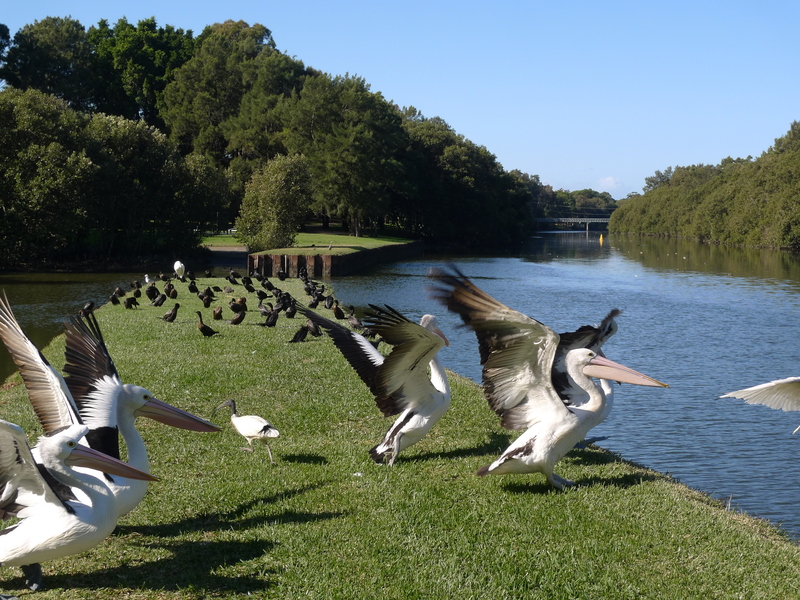 It takes me mostly along a stretch of the Cooks River cycleway. 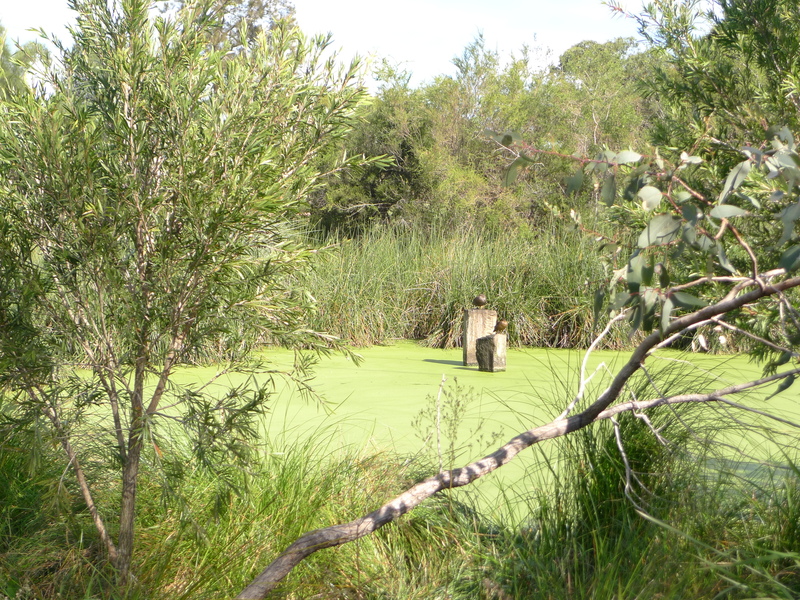 That’s the detention pond near the mouth of Cup and Saucer Creek, not long after I join the path on the south side of the river. When I took this picture it was full of unsightly green algae. It has since cleared up. 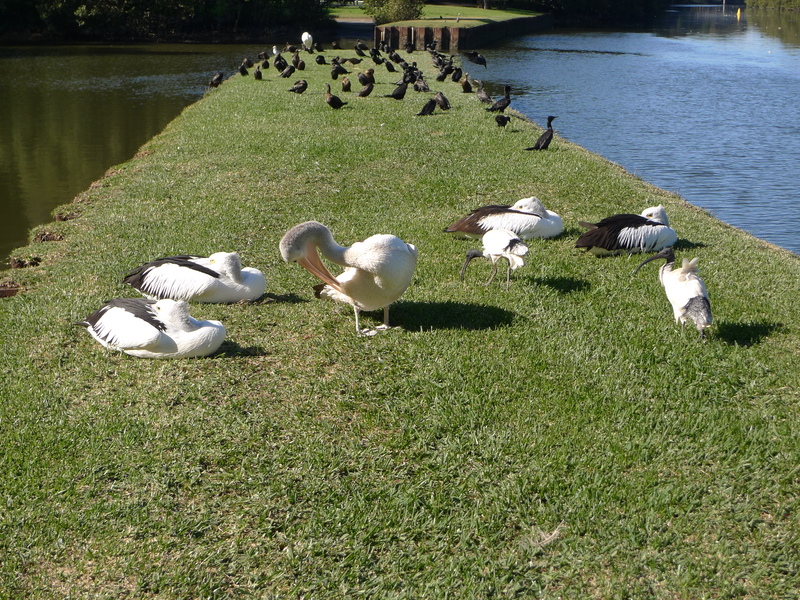 An area is fenced off to protect birds basking in the sun from pesky people. I suppose I got too close for comfort. though as we know it is but a drop in the ocean. The path continues past sometimes flood-prone land and (I’m being botanically imprecise here) pleasing stands of paperbarks which I guess find that congenial. 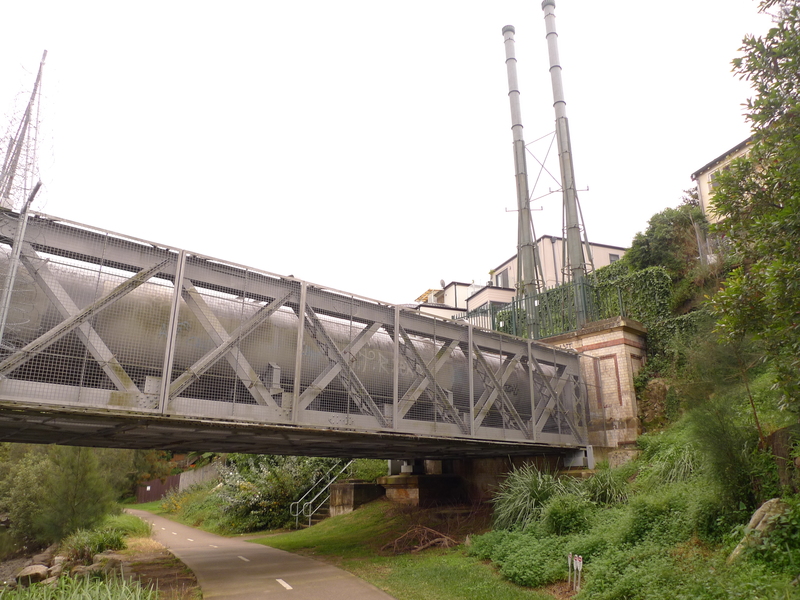 After passing playing fields and some decommissioned tennis courts, the path crosses the Cooks River again on a bridge which is definitely in need of renewal. 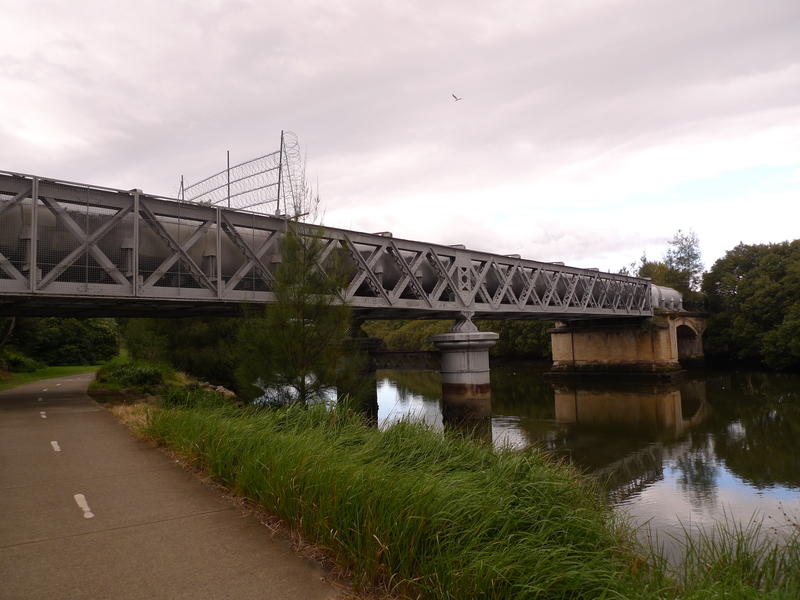 This brings the path back to the southern side of the Cooks River. 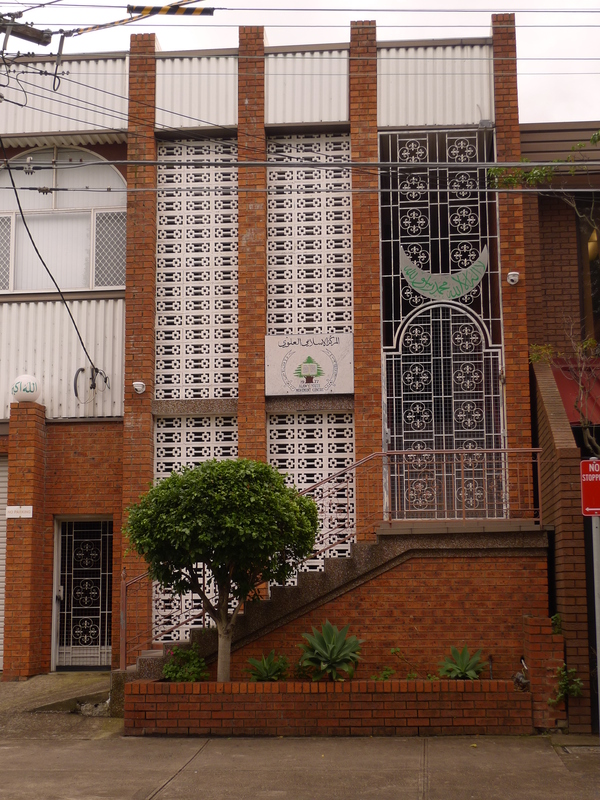 There is a mosque. I ride past the club house and out of the golf course, cross the bottom of Illawara Road and come to Steel Park. Even if I’m not really thirsty, I always pause for a drink of water here on principle. My father’s friendship with B dated from their first year in college together in Perth in 1943. After my father and B married and both couples found themselves living in Sydney from the mid-fifties on, the friendship continued between the couples and, in a quasi-cousinly way, their children as we arrived. We spent time together on holidays and every year shared an evening meal on Christmas Day. Perth was a small town. B and his wife even knew my stepmother who had also been at UWA with them. B was the last survivor of this little group. A few weeks ago I visited him at the nursing home to which he and his wife had moved shortly before her death. There wasn’t much left of him, at least that he was able to express outwardly. Last week I went to B’s funeral. I don’t think there will be any more such funerals to go to. I can only think of two other surviving contemporary friends of my father – one (they were at school together) is 92 and in Arizona, the other is in Canberra. (Both of these men also knew B.) In a way then, for me, it is the end of an era. Only at the funeral did I learn that B’s father, who had been a doctor in WWI at Gallipoli and later the Western Front, died of an “accidental” overdose of self-administered morphine when B was aged four. Almost the last thing I remember B saying to me was more than a year before that, when I had visited him at the nursing home. His speech was already a bit indistinct. “There’s lots of shuffling going on here,” he said. At first I thought he meant that there were lots of room changes going on, but then the penny dropped. It was a reference to Hamlet. Of course Chan was a defendant for the vexatious litigant proceedings, but those proceedings were concluded. It is now necessary to go back to the last proceedings referred to in the judgment of Adamson J, involving TAFE NSW and the examination summons. TAFE NSW obtained an order for costs in the proceedings brought by Chan against it. TAFE NSW had those costs assessed. Chan did not pay the costs. TAFE registered the assessment as a judgment in the Local Court. Once you register an assessment as a judgment you can then invoke the procedure of the court to enforce it. An examination summons is a procedure where a judgment creditor can bring a judgment debtor before the court where it has obtained a judgment to answer questions about his assets. The purpose is to enable the judgment creditor to obtain information about what means the debtor may have to satisfy the judgment, which the judgment creditor can then use to decide how to seek to recover its debt. The first step is to serve a notice on the debtor requiring the debtor to produce documents in relation to his means. TAFE did this in July 2010. Chan failed to comply with this. The next step is to get the court to issue an examination summons for the debtor to attend court and be examined. TAFE NSW did this, probably no earlier than late September 2010, as in October 2010 the Local Court made an order under Rule 38.3 for examination of Mr Chan, on 27 January 2011. The examination was adjourned to 17 February 2011 after Mr Chan filed a notice of motion seeking an annulment of that order. His motion was later dismissed and he was ordered to submit to the examination in the Local Court on 17 March 2011. The examination was deferred because in February 2011 Chan commenced the proceedings in the Supreme Court which were dismissed by Fullerton J on 30 June 2011. On 6 December 2011, Chan appeared before Magistrate Atkinson on the occasion set down for the examination. He sought another adjournment, on the basis that he intended to appeal Fullerton J’s decision. After considering the notice of intention to appeal which Mr Chan then produced, her Honour refused the further adjournment. It is worth pointing out that the time to commence any such appeal had well and truly passed and any application for appeal would have required leave of the court as a result of Justice Adamson’s orders made on 4 November 2011. The time to appeal from those orders had also passed, and no leave had been sought to appeal from Fullerton J’s orders. Magistrate Atkinson refused the adjournment and ordered Chan to enter the witness box to be examined. Chan refused. Magistrate Atkinson told Chan that if he refused, she would refer the matter to the Supreme Court for him to be charged with contempt of court. Chan still refused. The examination did not occur. In February 2012, the Prothonotary of the Supreme Court commenced a prosecution of Chan for contempt of court. This is a cumbersome procedure. It also encountered many delays. Chan was the source of many if not all of these delays. Proceedings were commenced by summons in December 2009. Chan sought legal aid – his application was rejected and the matter had to be stayed to permit him to appeal that rejection; he sought and was given pro bono legal advice, which it may be inferred he did not accept. Twice. In May 2014 Chan raised the question of his fitness to be tried, a question which the Prothonotary considered had to be resolved. This too proved a protracted process as Chan declined to provide his own psychiatric report or to be seen by Dr Allnutt, the psychiatrist finally selected by the Prothonotary to assess Mr Chan’s fitness to be tried in 2015. Ultimately Dr Allnutt opined that Chan was not unfit to plead. On 20 August 2015, by now up to no 15 in published reasons for judgment, Schmidt J held that, though Chan suffered from a mental condition that involved either delusions, or paranoia or likely both, he was fit to be tried. On 23 June 2016 Justice Schmidt found Chan guilty of contempt. Her reasons are No 20. On 21 July 2016, Justice Bellew made orders for Mr Chan to attend for a pre-sentence report and for the filing of submisions in time for a hearing on sentence to occur on 7 and 14 October 2016. As ever, that was not quite to be, but a sentence hearing did go ahead on 16 November 2016. But meanwhile, in December 2015, Justice N Adams had held that before deciding to refer a non-co-operating witness to the Supreme Court for prosecution, a magistrate had to offer the witness procedural fairness, and in particular an opportunity to make submissions as to whether the magistrate should deal with the contempt themselves – which they have the power to do. The significance of this is that if a magistrate deals with the matter, the maximum penalty is less. Maybe also section 32 of the Mental Health (Forensic Provisions) Act 1990 could apply. (That’s my speculation, not Justice N Adams’ and its application to someone like Chan would be problematic.) If the magistrate had not given a witness an opportunity to be heard on this question a prosecution by the Prothonotary is invalid. The Prothonotory appealed against this decision but in October 2016 the Court of Appeal dismissed that appeal – Prothonotary of the Supreme Court of New South Wales v Dangerfield  NSWCA 277 . At the sentencing hearing, the Prothonotary (not that the Prothonotary, a court official whose exact present identity is decidedly difficult to track down, does this themselves) brought Dangerfeld to the attention of Justice Schmidt, but submitted that it did not apply in the case of Mr Chan. On 2 June 2017, in judgment No 23, Justice Schmidt held that Dangerfield did apply. Chan had submitted that if it did apply, then that should be an end to the matter. Justice Schmidt instead ordered that the findng of contempt be revoked and the question of how Chan should be dealt with should be referred back to the Local Court. In other words, the clock should be wound back to the point where Chan had been denied the opportunity to make submissions as to whether the Local Court should deal with the matter itself. Despite Justice Schmidt’s stating that, because the finding of contempt was made before the decision of the Court of Appeal handed down its decision in Dangerfield, the proceedings were not a nullity, it is hard to avoid the feeling that all that went before in the Supreme Court was therefore essentially pointless. What was the point of the examination summons? the Constitutional objection to court fees (finally disposed of on 30 August 2010). The first of these strongly suggested he was hardly a man of means to start with and the second and third made him practically judgment-proof. You can’t garnish Centrelink payments (only Centrelink can do that). A public housing tenant has no house to be sold up. A moment’s reflection ought to have led to the conclusion that this situation was unlikely to change, especially given all that Chan’s many litigious ventures indicate about the kind of person he was, of which TAFE NSW must have had its own multiple demonstrations. Even if Chan did have some assets against which a judgment could be recovered, the proceeds of such recovery would be vulnerable to being clawed back as preferences if any other costs-creditors took the trouble to have their costs assessed and he were then sent bankrupt. I strongly suspect that most if not all of those with costs orders against Chan concluded that it was pointless even incurring the costs of having those costs assessed. In the light of the enormous public expense that has been incurred by the State of NSW in one guise or another to date in the pursuit of the contempt charges against Mr Chan, which has still not yet run its course, it seems to me a pity that TAFE NSW took a different view. This is the second post in a series of posts about Yau Hang Chan, his interaction with the court system (and some tribunals) and that system’s interaction with him. On 25 March 2011 the NSW Attorney-General commenced proceedings in the Supreme Court of NSW under s 8 of the Vexatious Proceedings Act 2008 (NSW) for orders prohibiting Chan from commencing proceedings in NSW and staying all proceedings in NSW without and subject to the leave of the Court. When the matter finally came on for hearing on 18 October 2011, Chan did not appear. He had previously filed submissions and sent various communications disputing the validity of the proceedings against him, including a message on the day of the hearing that he would not appear. The matter proceeded. On 4 November 2011 Justice Adamson made the orders sought. Most of Pointless I was drawn from Justice Adamson’s reasons for judgment. In addition to the proceedings listed in Pointless I, by the time the application was heard Chan had brought fresh proceedings in the Supreme Court against TAFE NSW. These proceedings were in relation to steps (of which more in Pointless III) that TAFE NSW had taken towards enforcing costs orders it had obtained against him. The proceedings were summarily dismissed by Justice Fullerton on 30 June 2011. What my account has necessarily abbreviated is the full nature of Chan’s conduct which founded Justice Adamson’s decision. You need to read her decision to appreciate the wide range of collateral issues raised by Chan in his proceedings, and the many claims which were made by him, many of them ultimately abandoned or never backed up or never backed up in any cogent way. A hallmark of many vexatious litigants is a capacity to perceive grievances and to formulate claims and arguments but a reluctance to bring them to finality. Faced with opposing arguments, fresh claims are brought, amendments and adjournments sought, applications are made to disqualify judicial officers. This is tremendously and unfairly burdensome to opposing parties and also to the courts. Just because the claims are meritless does not mean they can be ignored. Even if, in hindsight, Chan’s claims once dismissed can be seen as ridiculous and even foolish does not detract from the stress that they will have caused to those subject to them. Ultimately a stop has to be put to it. That stop does not prevent a vexatious litigant from attempting to bring a claim, but it does reverse the usual presumptive right of all persons to bring claims and the concomitant burden on the objects of those claims to respond to them. Before a potential defendant or respondent need be troubled with the vexatious litigant’s claims, the court will consider whether the claim has arguable substance. So you might think that Justice Adamson’s decision brought to an end Mr Chan’s entanglement with the court system and, more importantly, his entanglement of others. What a relief. What happened next is the subject of Pointless III. This is the first in a series of three posts about Yau Hang Chan, vexatious litigant who currently faces the prospect of prosecution for contempt of court. Like all long and sad tails, the beginning must lie buried in the mists of time, but it is necessary to begin somewhere. 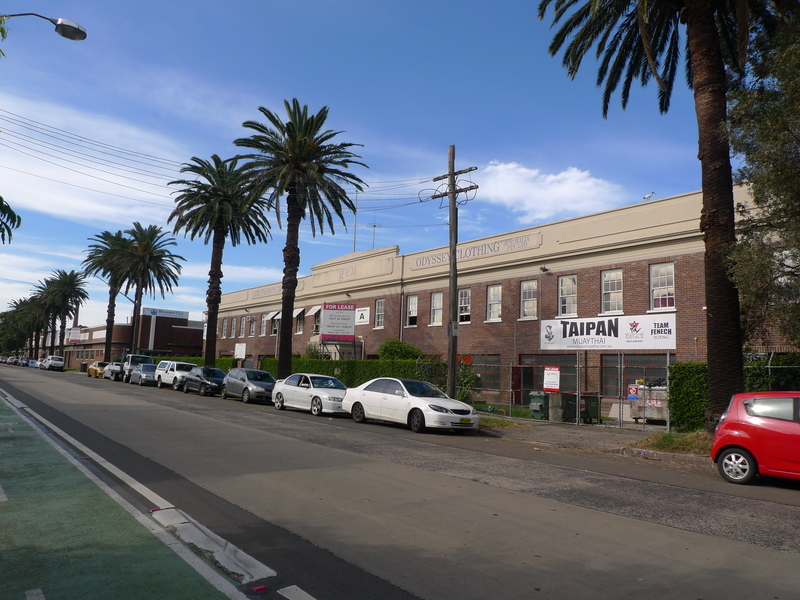 In February 2003 Yau Hang Chan entered into a residential tenancy agreement in respect of a room in a building at Croydon, for the term of one year commencing on 8 February 2003 and ending on 7 February 2004. That, you might observe, is pretty much the most humble rental accommodation possible. You can assume Chan was not a man of any substantial means. On 3 December, the landlord gave him notice that he had to leave at the end of the term. Chan did not leave and the landlords quite briskly obtained an order from the Residential Tenancy Tribunal for his eviction in March 2004. Chan resisted this order by appealing (I infer some time in March 2004) to the Supreme Court, on grounds, mostly procedural, which were ultimately found to be baseless on 13 August 2004. It counts as a mercy that he was then given until 27 August 2004 before the eviction order could be carried out. He reached the end of the road with an application to the Court of Appeal for a stay pending an appeal to the court which was rejected on 24 August 2004. Evictions are rarely carried out on the very first possible day, but nevertheless you can assume he was out pretty soon after that. This must have been a dark time for Mr Chan. On the other hand by his resistance he had effectively extended his occupation of the room for about six months, which was a pretty good result. Chan’s situation was apparently desperate enough for him to be allocated public housing, which he moved into on 18 February 2005. By then Chan had enrolled in January 2005 in a course at Ultimo TAFE. In the second half of that year he was enrolled in the subject “Develop and Apply Knowledge of the Library/Information Services Industries.” This ran from July to 30 November. On 15 November his teacher informed him that he had failed a group presentation assessment task. On 16 November 2005 Chan commenced proceedings challenging this in the Supreme Court against the the teacher personally and the TAFE Commission. When the matter first came before the court on 20 November it was stood down to give the parties the chance to reach a negotiated resolution. Mr Chan wanted to withdraw from the course without penalty. The TAFE Commission said that he could withdraw but that a fail would still be recorded. Chan withdrew and a fail was recorded. You can see that from his position the negotiations were fruitless and probably they were always going to be. Chan continued his proceedings. These were ultimately summarily dismissed by Master Malpass (actually by then he was an Associate Justice but Master Malpass has a much more satisfying ring) in June 2006. Mr Chan appealed unsuccessfully against this. He made FOI requests and appealed decisions against them. In 2008 he commenced fresh proceedings against his TAFE teachers’ superiors with claims in defamation, misfeasance in public office and negligence. Those claims, other than the claim for defamation, were dismissed in December 2009. Meanwhile, almost as soon as Chan had moved into his public housing, he came into dispute with the Housing Department (a loose term because there were name changes for the relevant entity from time to time). Some of these he agitated in proceedings in the CTTT (the Tenancy tribunal) leading to a deed of settlement in 2006. Claims by Chan eventually included that, from the outset, the Department had wrongfully backdated his lease by one day, that officials had defamed him, and various matters concerning condition reports and smoke detectors. In March 2008, Chan commenced proceedings against the Department. In 2008 he also commenced proceedings against an officer of the Department for defamation (and other matters) in relation to a letter she had sent him about inspection of smoke alarms in his property. Both proceedings were ultimately dismissed as hopeless by Justice McCallum in August 2009. On 22 January 2007, Rail Corp brought proceedings in Sutherland Local Court against Chan for allegedly travelling on a train without a ticket. This led to satellite proceedings commenced by Chan in April 2008 against the Local Court (a magistrate had set aside a subpoena) and even (in December 2008) against an employee of Railcorp who had appeared for Railcorp in the proceedings against the magistrate to inform the court that Railcorp rather than the magistrate was the proper defendant – as a result of which Chan was permitted to amend his summons. The proceedings against the Railcorp employee were dismissed in April 2009 and those against the Court (by which time the Attorney-General had also been joined) in September 2009. On 9 January 2009, Chan commenced proceedings against Ms Perry alleging conspiracy and defamation in a letter she had sent him in December 2007 from the office of the NSW Premier in response to letters from him complaining about certain conduct of the NSW Police Force and about certain legal proceedings. These proceedings were dismissed by Justice McCallum on 27 November 2009 on the basis that Chan’s pleadings and draft pleadings disclosed no reasonable cause of action ( Chan v Perry  NSWSC 1293). Along the way Chan made an application that Justice McCallum disqualify herself which she dismissed on 19 November 2009 ( Chan v Perry  NSWSC 1278). On 30 December 2009, Chan applied to the ADT for review of a decision by the NSW Police Force decision in respect of a decision it had made in a relation to a privacy complaint made by him in relation to its COPS records. This application was ultimately dismissed for want of prosecution by Chan. On 8 February 2010, Chan caused a summons to be issued from the High Court seeking a declaration that Schedule 1 of the Civil Procedure Regulation 2005 (NSW) (relating to court fees) was invalid. On 10 May 2017 this came before Justice Heydon – transcript here. Although Chan had failed to file a statement of claim as required by the rules, the case was remitted to the Federal Court. In the Federal Court Chan also filed a notice of motion seeking that certain Local Court proceedings be stayed. On 6 August 2010 Justice Perram dismissed that application and ordered that these proceedings be dismissed if Chan had not filed a statement of claim by 30 August 2010 and stayed until he did so. Chan did file something but in March 2011 Perram J held that it was not a statement of claim and so the proceedings had been dismissed on 30 August 2010. On 17 May 2010, Chan commenced proceedings in the Federal Court for preliminary discovery against Mr Harris, an employee of Catholic Care Sydney, which operates the Local Employment Training Solutions (LETS) program. Preliminary discovery is a procedure where you can obtain documents relevant to a claim you might have in order to decide whether or against whom to bring it. On the same day, Chan filed a statement of claim alleging that the report prepared by LETS and provided to Centrelink contained fraudulent and defamatory allegations and that those allegations were part of a conspiracy to injure him. Both cases came before Justice Cowdroy for case management. The application for preliminary discovery was ultimately dismissed for want of prosecution by Justice Cowdroy on 10 December 2010, but not before Chan had made an unsuccessful application that Cowdroy J disqualify himself because he had presided over a previous application by Chan in May 2009 for preliminary discovery. Those proceedings were against Tran, an employment consultant to Centrelink, for documents relating to Chan. Cowdroy J had made orders for preliminary discovery, Tran had produced some documents, Chan complained that production was incomplete and brought a notice of motion against Tran for contempt, Tran produced some more documents, Cowdroy J gave leave to Chan to withdraw the application for contempt and the proceedings were otherwise dismissed by Cowdroy J in June 2009. Chan appealed against Cowdroy J’s refusal to disqualify himself and then against the final decision. The appeals were ultimately dismissed (after various collateral issues were raised by Chan) by Justice Katzmann on 11 April 2011. Chan instituted a fresh appeal which was dismissed by Justice Rares in May 2011. By then, steps were underway to have Chan declared a vexatious litigant. That will be the subject of the next post in this series. You are currently browsing the Stumbling on melons blog archives for June, 2017.